Guidestones Fans! Help us get to the Streamy Awards by submitting your nomination via the official 3rd Annual Streamy Awards widget below! Every vote counts! 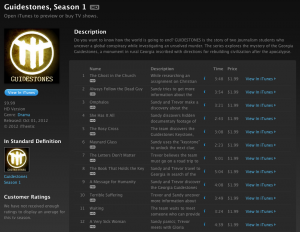 GUIDESTONES: Now Available on iTunes! We are pleased to announce that Guidestones is now available for download on iTunes! Now there are even more ways to decode the conspiracy! Posted in News | Comments Off on GUIDESTONES: Now Available on iTunes!